The winners of the sixth annual Washington Post Peeps Diorama Contest were announced today! This is one of the most hilarious Easter traditions I know of. 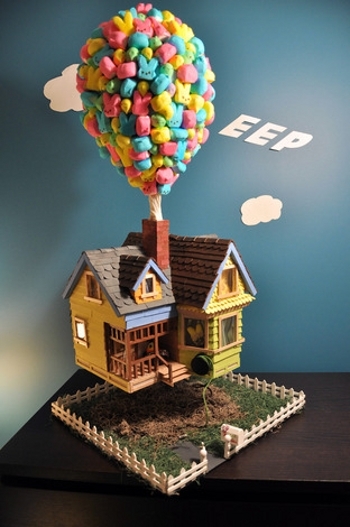 Every year the Post gets hundreds of entries to their diorama contest centered around Peeps. Anyone can submit a diorama, but there are a few rules: one person must be able to carry the scene by themselves to the Post offices, and only residents of D.C., Maryland or Virginia can be selected as finalists. The dioramas are usually based on news-worthy events of the previous year or well-known images, and are full of peeps related puns. For a slideshow of this year's Washington Post winners click here. 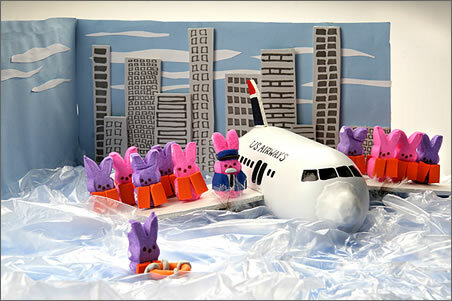 A lot of newspapers and arts centers have started holding Peeps Diorama contests. Here are some past favorites. For more curious and crazy Peeps projects, check out this Washington Post piece, "Eat Them, Craft Them... Kill Them?" -- including a video by 100 Ways to Kill A Peep (Warning: This is not for the faint of heart).